Engage! 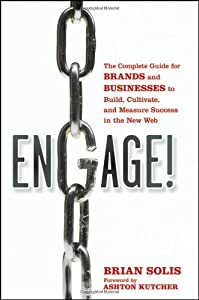 The complete guide for brands and businesses to build, cultivate and measure success in the new web. Brian Solis . 2010. ISBN 9780470619704. If you struggle in a company that has dinosaurs for marketing heads, who just do not get the impact of social media, this is your new bible. Solis starts with a very comprehensive lay of the land, filled with big name company successes. From that he provides a foundational approach to why this works. But his big addition to this field is how he takes a deep dive into traditional marketing “theology” and shows through example and metaphor how social media does and must fit into every marketing departments POV and plans. Along the way you will learn so much more than you ever suspected was working with social media. (E.g. even his title is designed to garner lots of SEO and tagging points) Ever the pragmatist, Solis points out all the short cuts and programs available to those with the big budgets, but he never loses sight of the reason for business- to make a customer. Thanks to Troy Agrignon who “donated” the download to force me to add it into the Kindel. New for me, a total digital read. Can not decide if I like it a whole lot. I read, not browse books and attempt to make them part of who I am. Seeing I have a terrible memory, I flip back and forth in a book to reread sections to refresh the ideas. That’s tough digitally, plus I have a litany of methods to increase my comprehension of a book. which are hard to do on a digital machine. But you have to love the form factor, so I will need to develop speed reading methods for the digital world. Putting the Public Back in Public Relations. How social media is reinventing the aging business of PR. Brian Solis & Deirdre Breakenridge. The End of Business as Usual. Brian Solis. Social Marketing to the Business Customer. Paul Gillin & Eric Schwartzman.